Camunda BPM is an open-source workflow and decision automation platform. Camunda BPM ships with tools for creating workflow and decision models, operating deployed models in production, and allowing users to execute workflow tasks assigned to them. By default, Camunda comes with an embedded database called H2, which works pretty decently within a Java environment with relatively small memory footprint. However, when it comes to scaling and high availability, there are other database backends that might be more appropriate. In this blog post, we are going to deploy Camunda BPM 7.10 Community Edition on Linux, with a focus on achieving database high availability. 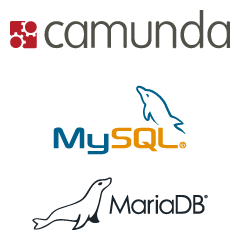 Camunda supports major databases through JDBC drivers, namely Oracle, DB2, MySQL, MariaDB and PostgreSQL. 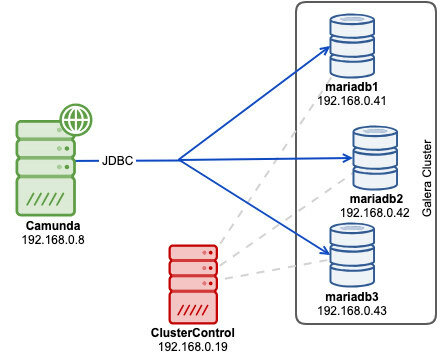 This blog only focuses on MySQL and MariaDB Galera Cluster, with different implementation on each - one with ProxySQL as database load balancer, and the other using the JDBC driver to connect to multiple database instances. Take note that this article does not cover on high availability for the Camunda application itself. There are a number of dependencies we have to configure before starting up Camunda web application. This depends on the chosen database platform like datastore configuration, database connector and CLASSPATH environment. The next sections explain the required steps for MySQL Galera (using Percona XtraDB Cluster) and MariaDB Galera Cluster. Note that the configurations shown in this blog are based on Apache Tomcat environment. If you are using JBOSS or Wildfly, the datastore configuration will be a bit different. Refer to Camunda documentation for details. We will use ClusterControl to deploy MySQL-based Galera cluster with Percona XtraDB Cluster. There are some Galera-related limitations mentioned in the Camunda docs surrounding Galera multi-writer conflicts handling and InnoDB isolation level. In case you are affected by these, the safest way is to use the single-writer approach, which is achievable with ProxySQL hostgroup configuration. 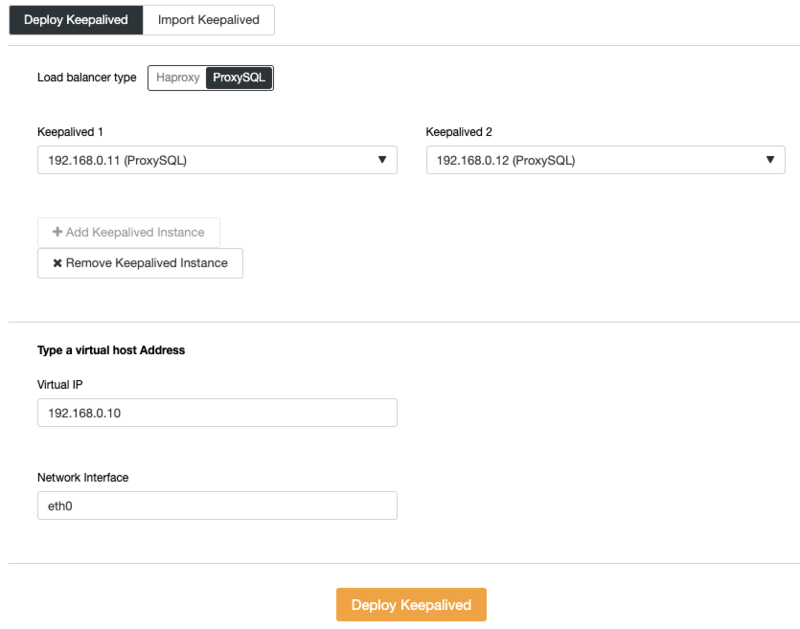 To provide no single-point of failure, we will deploy two ProxySQL instances and tie them with a virtual IP address by Keepalived. Save the file and we are good to go. The above are the requirements as stated in Camunda docs, especially on the supported transaction isolation for Galera. Variable wsrep_sync_wait is set to 7 to perform cluster-wide causality checks for READ (including SELECT, SHOW, and BEGIN or START TRANSACTION), UPDATE, DELETE, INSERT, and REPLACE statements, ensuring that the statement is executed on a fully synced node. Keep in mind that value other than 0 can result in increased latency. Make sure you got all the green ticks, indicating ClusterControl is able to connect to the node passwordlessly. Click "Deploy" to start the deployment. There is no read-write splitting configured for ProxySQL. 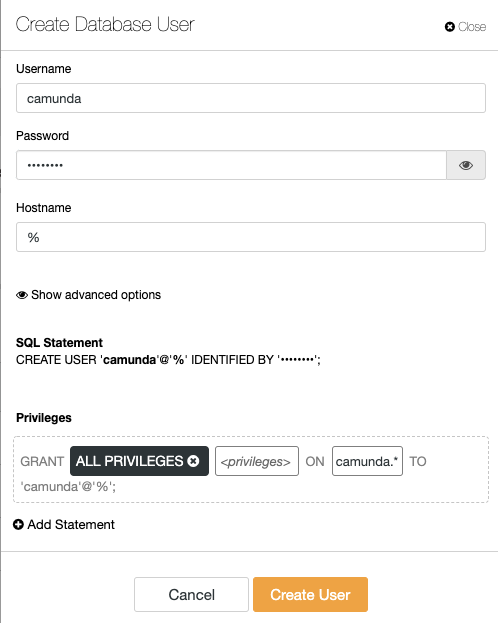 Camunda uses "SET autocommit=0" on every SQL statement to initialize transaction and the best way for ProxySQL to handle this by sending all the queries to the same backend servers of the target hostgroup. This is the safest method alongside better availability. However, all connections might end up reaching a single server, so there is no load balancing. When the connector tries to connect, it will always try host1 first. If that host is not available, then it will try host2. etc. When a host fails, the connector will try to reconnect to hosts in the same order. (available since 1.2.0) This mode supports connection failover in a multi-master environment, such as MariaDB Galera Cluster. This mode does not support load-balancing reads on slaves. The connector performs load-balancing for all queries by randomly picking a host from the connection URL for each connection, so queries will be load-balanced as a result of the connections getting randomly distributed across all hosts. Save the file and we are good to go. A bit of explanation, the above list are the requirements as stated in Camunda docs, especially on the supported transaction isolation for Galera. Variable wsrep_sync_wait is set to 7 to perform cluster-wide causality checks for READ (including SELECT, SHOW, and BEGIN or START TRANSACTION), UPDATE, DELETE, INSERT, and REPLACE statements, ensuring that the statement is executed on a fully synced node. Keep in mind that value other than 0 can result in increased latency. 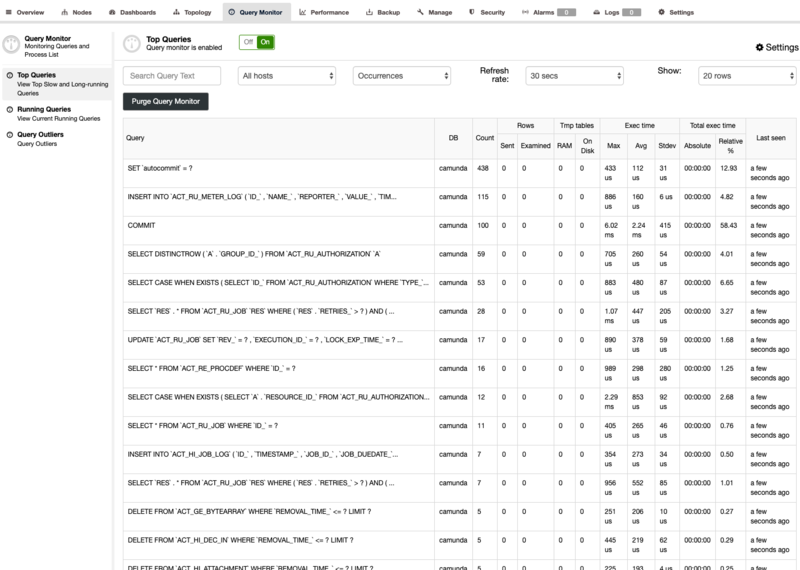 Enabling Performance Schema is optional for ClusterControl query monitoring feature. Make sure you got all the green ticks when adding nodes, indicating ClusterControl is able to connect to the node passwordlessly. Click "Deploy" to start the deployment. With MariaDB Connector/J, we do not need load balancer tier which simplifies our overall architecture. The sequential connection mode should do the trick to avoid multi-writer deadlocks - which can happen in Galera. This setup provides high availability with each Camunda instance configured with JDBC to access the cluster of MySQL or MariaDB nodes. 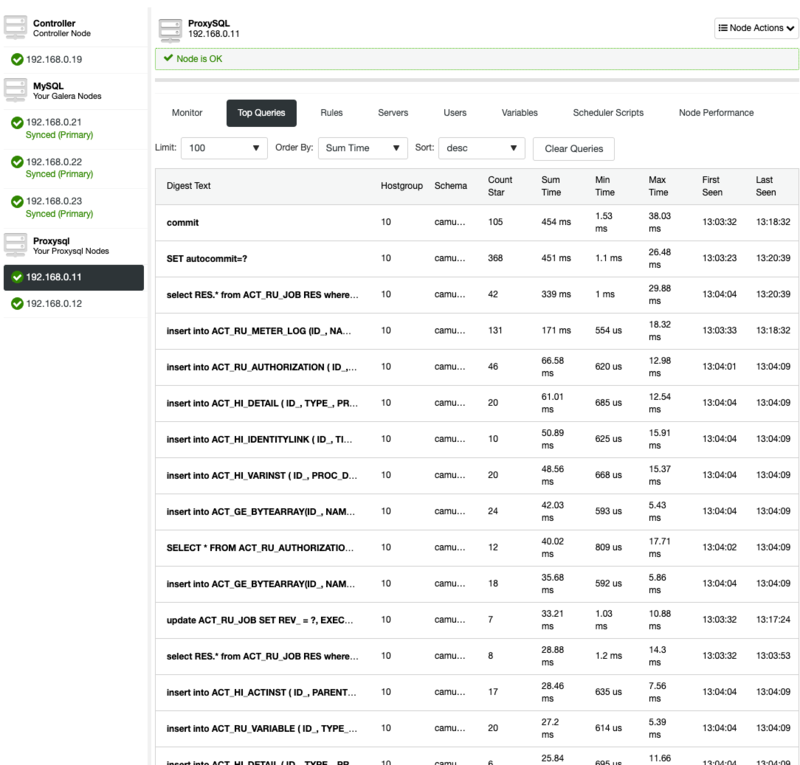 Galera takes care of synchronizing the data between the database instances in real time.